This is the fifth article in a series reviewing the Samsung Galaxy S4 Mini. In the second article of this series I claimed I would be reviewing Tech21’s case next week. I changed my plans several times, however finally, today it is going to be reviewed! I am going to rate this case against the same criteria that I rated the FlexiShield case, so it is easy to make a comparison. Tech21’s case currently costs around £25, which is about £15 more than the FlexiShield one. The FlexiShield case was very competitively priced, however I do feel that the Tech21 one is worth the extra expense. Like the FlexiShield case, the Tech21 case is also reasonably flexible. My S4 Mini fits perfectly into the case, and unlike the FlexiShield case, all the ports and sensors are pretty much perfectly aligned. Furthermore the depth of the case means that if it is resting on its back, the camera isn’t touching the ground. I really like how this case has two buttons for volume, as one thing that annoyed me with the FlexiShield case was that it was all one button, so you were never sure which button you were pressing! How D3O molecules react under pressure. Unlike any other case on the market, the Tech21 Impact Mesh case has D3O embedded into the design. 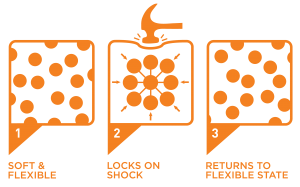 D3O is an ‘intelligent’ (or smart) material which is pliable and malleable, however when put under stress, the molecules interlock and it becomes rock solid – absorbing the impact. The case certainly works, as I have dropped and banged my phone several times, yet it still works and there isn’t a scratch in sight! To see a D3O case put to the test check out this video. I haven’t noticed my phone getting as hot in this case either, although it does appear to lack ventilation, like the FlexiShield alternative. Aesthetically, I think my phone looks really good in the case. It is stylish and sleek, and I think it actually makes the phone look better. 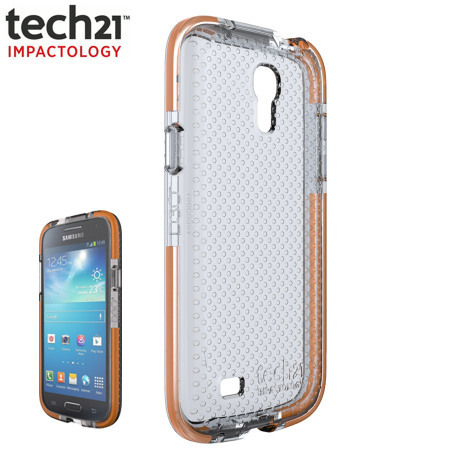 Tech21 make two very similar versions of this case for the S4 Mini, the Impact Mesh Case and the Impact Maze Case. The only real difference is that the Mesh has dots on the back and the Maze has lines. I personally prefer the dots, hence why I went for the Impact Mesh. As mentioned above, Tech21’s case offers great protection thanks to the D3O. Like the FlexiShield, this case has a lip which means if you put the phone screen down, the screen doesn’t touch the ground. As you would expect, the case protects the phone from superficial dirt and smears, and is easy to wipe clean. The D3O protects my phone from pretty much every angle. The Tech21 Impact Mesh Case is stylish and offers my S4 Mini great protection, it is priced higher up the range than the FlexiShield, however, I feel the design quality justifies this. Overall I rate Tech21’s Impact Mesh Case 4.5 star. I would like to thank Mobile Fun who provided the case for this review. Next time I will be reviewing a car holder for the S4 Mini. I like the sound of this D30 and the fact that it will return to its original state post impact. Certainly beats getting a rigid case that will just get a dent. Having a flexible case should also minimise any shock damage if you drop the phone. It seems to be working so far Neil, I have dropped my phone a few times and it hasn’t broken yet!